**IMPORTANT NOTE** Be sure to click on the ‘click here’ button (see the image below) so that you will NOT get subscribed to Good Housekeeping magazine! Hurry on over here to score a FREE Swiffer Duster sample! Be quick – only available to the first 15,000! 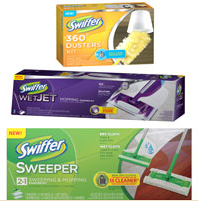 Plus, the first 50 lucky winners will each receive a Swiffer Wet Jet Starter Kit, Swiffer 360 Duster Starter Kit, and Swiffer Sweeper Starter Kit. Good luck! Hi Twee - did you make sure you did this **IMPORTANT NOTE** Be sure to click on the ‘click here’ button (see the image below) so that you will NOT get subscribed to Good Housekeeping magazine! Even if you are subscribed when you get your first payment card just write CANCEL in big letters and they won't bother you again. I've done this for a Just Seventeen Magazine sub that i did not want but was just entering a contest. Otherwise just call their 1800 number and they will resolve it. Good luck.